Tracing the migratory and cultural history of individuals or families back more than a century sounds like a daunting task, but that’s what University of Oregon students in the Latino Roots I and II classes were tasked with the past two terms. 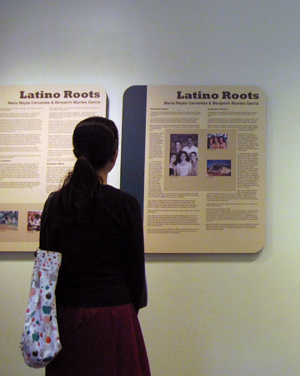 The two-term Latino Roots course focuses on giving a theoretical and ethnographic understanding of Latino immigration and settlement in Oregon during the past century and a half. With that foundational knowledge, students then learn how to produce a short video documentary from oral history interviews. Those documentaries will premiere at the third annual Latino Roots Celebration, to be held Thursday, June 4, in the UO’s Knight Library Browsing Room from 4 to 6 p.m. The event is free and open to the public. As has been the norm for the past few years, the students’ projects will be placed in the UO library’s Special Collections and University Archives. Other films include the story of an immigrant who came to Oregon looking for better opportunities for himself and his son, “Carlos Enrique Marquez,” created by international studies major Keaton Rogers. A documentary by anthropology and Latin American studies student Nicole Johnson, “Bridging Cultures,” is also set to premier at the event and details the story of how Oregonians have accepted, or excluded, immigrants and their native culture. In addition to the film screenings, the event will feature food, music from Springfield High School’s Mariachi del Sol and important speakers. Dean of Libraries Adrienne Lim, interim UO President Scott Coltrane and Pineros y Campesinos Unidos del Noroeste Secretary-Treasurer Jaime Arrendondo will give remarks about the importance of the work of the students as well as the societal contributions of Latino immigrants in Oregon. PCUN is a labor organization based in Woodburn that advocates for the Latino population in Oregon and farmworkers’ rights. The organization’s archives, permanently housed in the university’s Special Collections, will also be on display at the event. This year, the course was co-taught by Lynn Stephen, a professor in the UO Department of Anthropology, and Sonia De La Cruz, a professor in the UO School of Journalism and Communication. The course was made possible by a grant from the Tom and Carol Williams Fund for Undergraduate Education. The event is sponsored by the Center for Latino/a and Latin American Studies, School of Journalism and Communication, College of Arts and Sciences, Department of Anthropology, Division of Equity and Inclusion, UO Libraries and SELCO Community Credit Union.